Discover your inner acrobat at CREACTIVE by Cirque du Soleil - a circus inspired playground for all ages. Master your game with lessons by the professional coaches at our Club Med Academies, where it’s all fun and games! Rediscover an enhanced resort and new life forms in the Great Mesoamerican Barrier Reef, just steps away from the comfort of your room. *Sample discount is based on double occupancy in a Club category room on select weeks at Ixtapa Pacific, Mexico; Cancun Yucatan, Mexico; Punta Cana, Dominican Republic; Sandpiper Bay, Florida, USA; Caravelle, Guadeloupe; Buccaneer’s Creek, Martinique; Columbus Isle, Bahamas, and Turkoise, Turks & Caicos. Discounts on other dates, room categories and/or at other resorts varies. 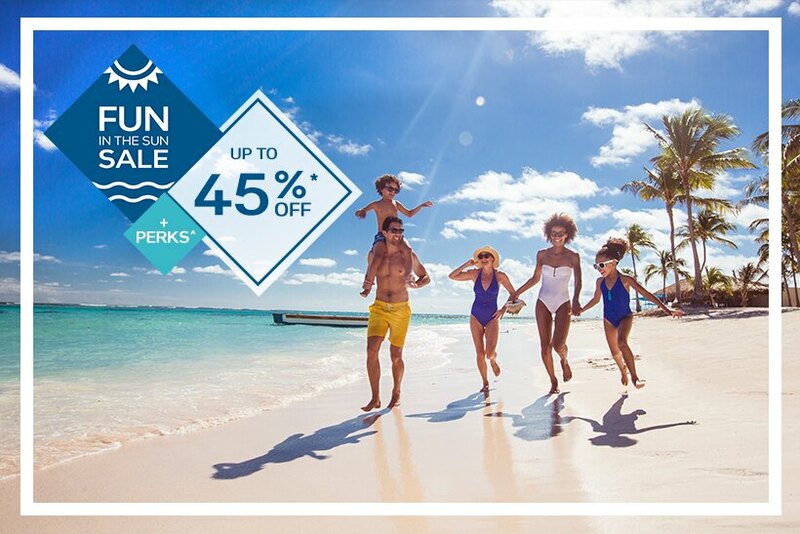 ^Plus Perks Air Credit: Sample $300 air credit is per person, based on a 7-night stay in a Suite category room on select weeks at Club Med Cancun Yucatan, Mexico and Punta Cana, Dominican Republic. Credits on other dates, resorts, stay duration, room categories may vary. Children between 13 and 15 years of age receive 70% of the air credit of an adult. Children between 4 and 12 years of age receive half of the air credit of an adult. Children under 4 do not receive an air credit. Offer requires a 3-night minimum stay and air must be booked through Club Med. Valid for new individual bookings only for select travel dates. Single Supplement: Offer available only at Club Med Cancun Yucatan, Mexico; Ixtapa Pacific, Mexico; Sandpiper Bay, Florida; Columbus Isle, Bahamas; Turkoise, Turks & Caicos; and Punta Cana, Dominican Republic. Valid for new individual bookings only for select travel dates. Free room upgrade: is available select weeks at Punta Cana, Dominican Republic (From Superior Room near Zen Oasis (B), to Family Superior Room - near Zen Oasis (B+)), Cancun Yucatan, Mexico (From Family Superior Room – Oceanfront (B4) to Family Deluxe Room – Oceanfront(A4 ) and from Superior Room – Ocean side, Aguamarina (B) to Family Superior Room - Oceanfront, Aguamarina (B4)), Ixtapa Pacific, Mexico (From Superior Room beach side(C+) to Family Deluxe Room - Balcony (A)), Sandpiper Bay, Florida (From Family Superior Room Bay view (B+) to Deluxe Room (A)), Columbus Isle, Bahamas (From Superior Room Ocean View (C+) to Deluxe Room - Ocean View (A+)). Kids under 4 Stay Free: Children aged under 4 years stay for free at our family destinations (exclusion for Holiday weeks: children 3 years stay at 50% of the adult price). Children aged 4-11 years stay at up to 50% off adult price at select family resorts. Children aged 12-15 years stay at up to 30% off adult price at select family resorts. For flights that are booked through Club Med, tickets for children must be paid for by the client. Children who are eligible to stay for free must be lodged in the same room as the adults who are paying for their stay, or in a connecting room. Blackout dates may apply. Costs associated with Baby & Petit Club Med are at full day rate during entire stay booked. General Conditions: Blackout dates apply, including holidays and other dates. Offer requires a 3-night minimum stay (7-night minimum for Columbus Isle). Available at select resorts. Valid for new individual bookings only for select travel dates with check-in on or after 01/10/2019 and check-out on or before 08/24/2019 and must be booked between 01/10/2019 and 02/27/2019. Offer is subject to capacity control and may increase or be withdrawn at any time. For Turkoise all guests must be at least 18 years of age. Guests at Columbus Isle must be at least 2 years of age. Club Med Membership fees of $60 per adult and $30 per child are additional. Other restrictions apply including brochure terms and cancellation/change fees. Not responsible for errors or omissions. Void where prohibited or restricted by law. CST#: 2020955-50.